Maintained and flown by the Royal Navy Historic Flight, the venerable Hawker Sea Hawk is a tribute to veterans of the Royal Navy’s Fleet Air Arm and an example of Hawker Aircraft design excellence. This first generation jet fighter found its niche as a ground attack aircraft and served faithfully in combat. Eight years after losing Joe Tobul and his Corsair, Jim Tobul returned his dad’s F4U-4 Corsair to flying condition. For its poignant family connection and its powerful wartime history, the Tobul family Corsair named Korean War Hero is one of the most significant restorations in years. It’s common for a P-51 Mustang to be painted in the markings of a plane that flew during World War Two but when Dan Fordice chose a paint scheme he not only knew the pilot and namesake, they were friends. This is the story of Cary Salter, a combat veteran AAF pilot, the plane he lovingly named Charlotte’s Chariot II, and the Mustang that bears its name today. One of the flagship aircraft of the Heritage Flight Museum in Bellingham, Washington is the mighty A-1 Skyraider known as The Proud American. 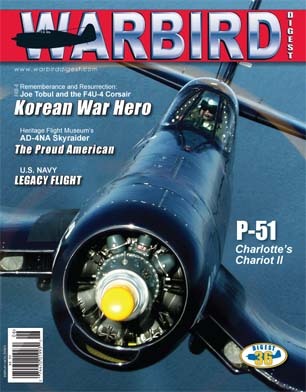 This article explores the development of the Skyraider and the history of AD-4NA BuNo 126965. When World War Two veteran pilot Frank Lynott decided to fund a restoration project he consulted his Vietnam veteran friend, Don Keating. They found their inspiration in a TA-4 Skyhawk project and chose Mike McDougall of Fighting Classics to perform the intense and thorough rebuild. The result was a stunning, one-of-a-kind jet warbird. The Centennial year of U.S. Naval Aviation is underway. In addition to utilizing the well-known Legacy Flight program to honor their proud heritage the Navy also sought to commemorate the past 100 years by painting active duty aircraft in vintage paint schemes. This bold initiative has the aviation world buzzing.